- one artefact, one photograph and one piece of music. I'm not sure there is any limit to how this activity can be used. This is the blank template that you could get learners to complete in pairs / small groups before leading a whole class discussion. 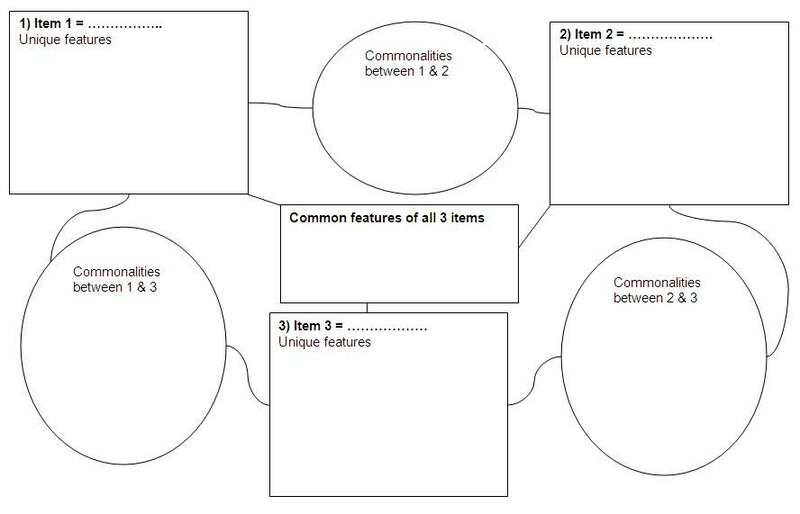 Try to insist that every box is filled with at least one common / unique feature: the real thinking starts with the boxes that are more challenging to complete. As with any new tool, learners will take a while to get used to it, so perhaps try it out with some very familiar objects / ideas first. I wanted to have a pupil examine the difference between concrete cement and glass also having an idea where they are similar. I used it as a plenary. Worked well. Good tool for assessing understanding and had the pupil thinking. Very quick to prepare. fiction novel. Comparisons were made between Utopia, dystopia and the world we live in. I encouraged her to not simply divide the "good"
simultaneously engage with the genre of the text. I used it as a plenary. It worked well, as it clarified aspects of the novel and also stretched the imagination of the pupil. I used it as a starter, as they were struggling with the differences of the 3 groups. Made things clearer and they can refer to it when needed. Good tool for improving understanding of a particular topic and had the pupils thinking and working together. Very quick to prepare. I tried this with a Year 9 ICT group looking at logos; it was a great starter at the beginining of the project and got them to really analyse 3 well known logos quickly and it has stayed with them. You can keep returning to this task throughout the rest of the project as a reminder of good pointers to designing a unique logo. I used this in a Year 5 Literacy lesson where the focus was story openers. I gave the class three different story openers by Michael Morpurgo. They then had to compare the three extracts and look for the unique and common features of each one (dialogue, description, action, flashback). The children really enjoyed it. They were engaged and were able to draw out the features themselves. They quickly got the idea of the three groups and what each box was for.